Red Steagall has had three overlapping careers in the space of little more than 30 years and can take credit for discovering one great country talent, Reba McEntire. As a songwriter he's been responsible for over 200 compositions, several of which have become hits in the hands of other performers. As a Nashville-based artist, Steagall had his share of chart action in the 1970s and a few major hits. And as a singer of Western songs as well as an author of poetry about the West, he is one of modern music's cowboy balladeers. Steagall was born Russell Steagall in Gainesville, TX, on December 22, 1937. He became a bull rider at rodeos while he was still a teenager, but at the age of 15 Steagall was stricken with polio and took up the guitar and the mandolin as therapy to recover the strength and dexterity of his arms and hands. He attended West Texas State University, and while he was there he formed his first group, a country band. Steagall went to the West Coast, where he had some success playing the folk clubs in the area around Los Angeles and had his first success as a songwriter in 1967, at age 30, when Ray Charles recorded his "Here We Go Again," which was later covered by Nancy Sinatra. Steagall was signed to Dot Records in 1968, but after three years he moved over to Capitol, where he had his first country hit, "Party Dolls and Wine," in 1972 under the name Steagall. Soon after, he had a Top 20 country hit with "Somewhere My Love." He moved to Nashville in 1973 and followed up these two singles with two more hits, "True Love" and "If You've Got the Time." Steagall was a regular guest at rodeos, and while he was performing at the National Rodeo Finals in Oklahoma City in 1974, he spotted a young singer named Reba McEntire who was appearing with her family. He got her to record a demo and made sure that it was heard by anyone who could do McEntire some good, which resulted in her being signed to a recording contract while still in her teens. Steagall continued to have hits, including "I Gave Up Good Morning Darling" and "The Finer Things in Life," both of which made the Top 20, and scored a Top 15 single with "Lone Star Beer and Bob Wills Music" in 1976. His recording of "I Left My Heart in San Francisco" made the charts as well. In the late '70s, he began moving toward Western music as much as country. Steagall moved to Elektra Records in 1979, and in 1980, he decided to leave Nashville and took up residence at his ranch near Fort Worth. His Western recordings began yet another phase to Steagall's career. With his band, the Coleman County Boys, he became singularly popular at rodeos, and his records achieved a major following among fans of cowboy songs. His poems "Ride for the Brand" and "Born to This Land" were also extremely popular, and during the 1980s Steagall also had acting roles in several films, including Benji the Hunted, Dark Before Dawn, and Big Bad John. 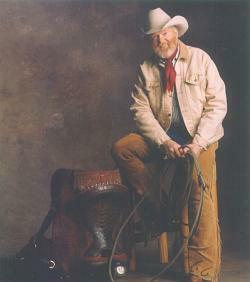 In 1991, the Texas legislature voted Steagall the Official Cowboy Poet of Texas. Soon after, he began recording for the Warner Western imprint, issuing Born to This Land in 1993. Steagall recorded steadily throughout the decade, releasing Faith and Values in 1995, Dear Mama, I'm a Cowboy in 1997, and Love of the West in 1999. Wagon Tracks appeared in 2002 from Shanachie Records, followed by The Wind the Wire and the Rail from Wildcatter Records in 2006.